Thai Riffic is a chain restaurant located outside of Westfield Parramatta and it’s in a great location for quick eats. I love Thai food and Sydney has Thai food in abundance. They were pretty busy at dinner time but the wait was short. This entry was posted in Sydney Food and tagged pad see ew, pad thai, skewers. A few weeks ago the Royal Family Circus was in town and my friends and I got cheap tickets on Groupon! It was only $15 each so that was a great deal for a night of entertainment. They were set up on the PNE fair grounds so we went to Bai Bua Thai on E. Hastings and Nanaimo for dinner first. It’s right across from the 95 B-line stop. This entry was posted in Asian, Food Reviews, Thai and tagged curry, pad thai, pineapple fried rice, skewers. My friend and I watched Captain America: Civil War at the new theatre at Marine Gateway and needed to get some food after so we went to Pink Elephant Thai. This entry was posted in Asian, Food Reviews, Thai and tagged chicken wings, pad thai. I’ve passed by Milestones on Broadway and Cambie a lot and it always looked nice but I’d never been inside before. Okay to be fair I haven’t been in a few years anyway. The restaurant is on the second floor and It’s actually really open and spacious inside with the usual dim lighting and many TV’s with sports games on. My friend had a gift card that she needed to use so she invited me to come along with her. This entry was posted in American/Burgers, Food Reviews and tagged bellini, burgers, fries, pad thai. 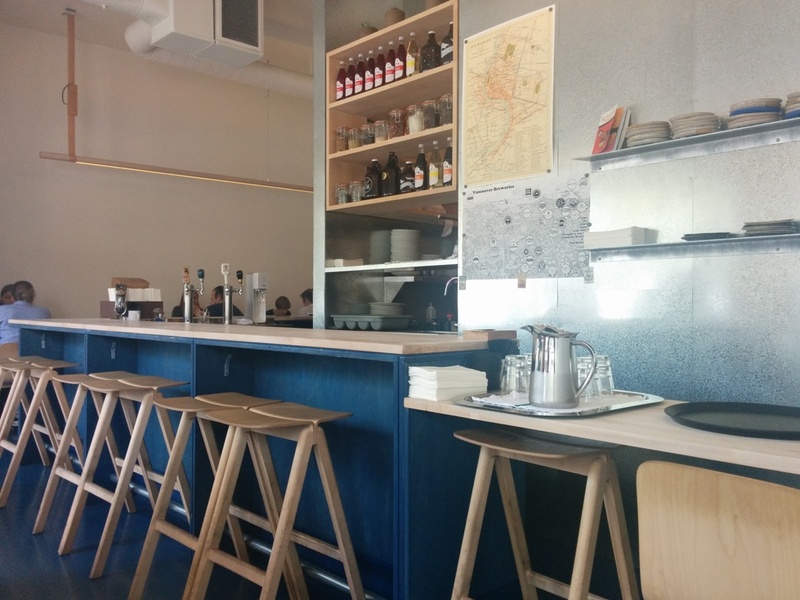 In my attempt to explore Commercial Drive more, I dragged my friends to Kin Kao Thai Kitchen. 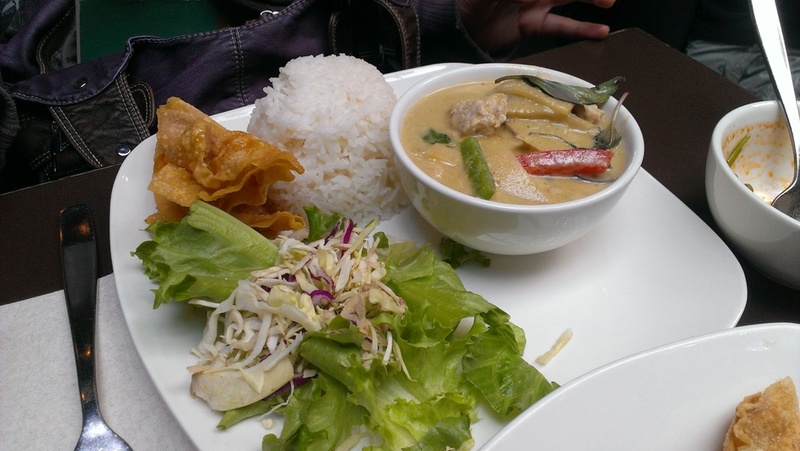 This entry was posted in Asian, Food Reviews, Thai and tagged green curry, pad thai. It was about time that I got my hands on some Thai food which I clearly don’t eat often enough! We arrived at Sawasdee Thai for lunch and they were understaffed so we had to wait 10 mins for a table even though they had tables but they weren’t cleared and there were only two servers working. Since we had to wait for a table, we spent our time deciding what to order. All their lunch specials are under $10 and come with a spring roll and a skewer. They are also closed for lunch on Mondays. 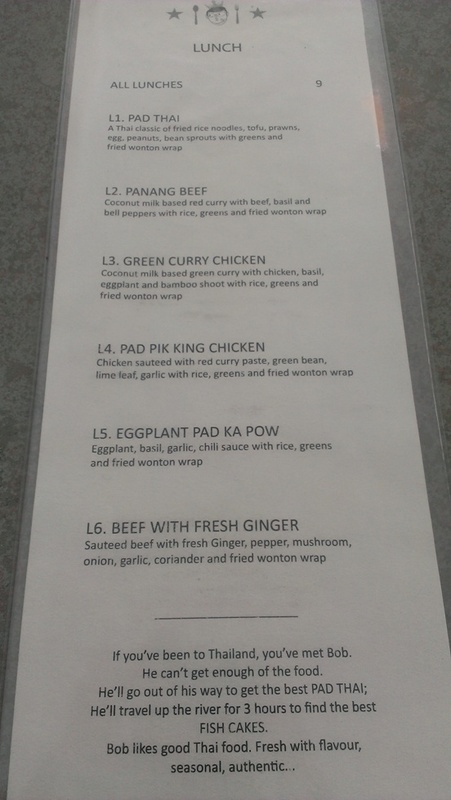 This entry was posted in Thai and tagged chicken, curry, green curry, lunch specials, pad thai, skewers, spring rolls, thai. 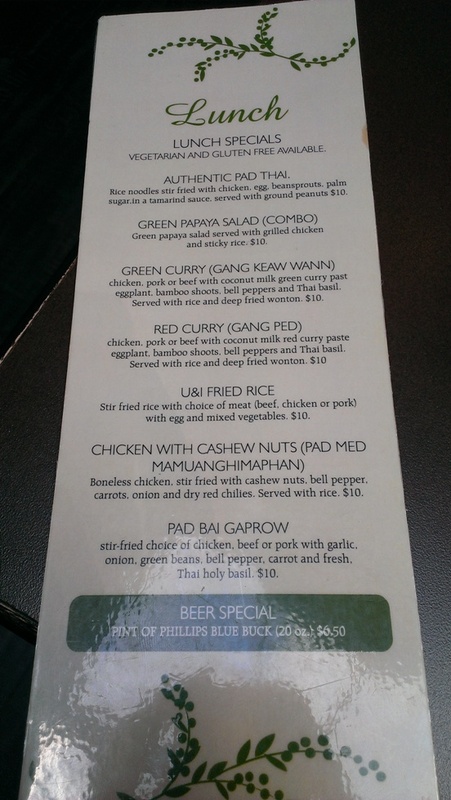 I’ve been meaning to try Bob Likes Thai Food for while especially due to the funky name. Yes I’m a sucker for cool names. The restaurant was empty except for us at 1pm on a Friday afternoon and no Bob in sight of course. Bob is suppose to represent the average Joe who likes Thai food. We were about to find out if we were going to be a bunch of Bob’s that day. 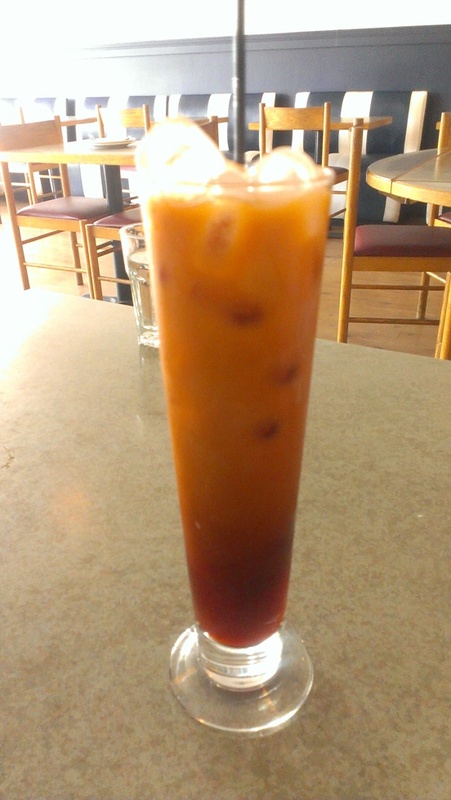 My friend ordered a Thai Iced Tea and it was served in this tall skinny glass. I’ve never tried Thai Iced Tea before so this was my first time. It was really good! It was comparable to HK style milk tea but a lot sweeter. The lady who served us said that they don’t use condensed milk in their version which is what is traditionally used I believe. 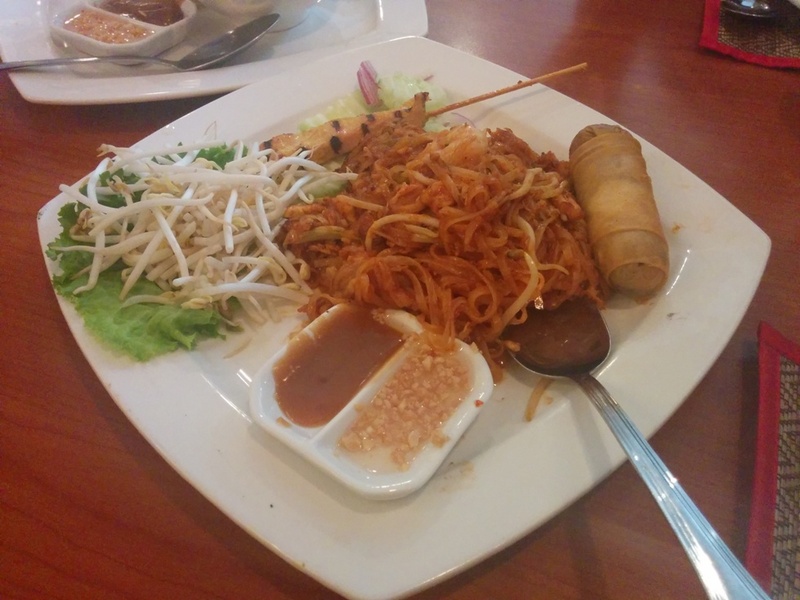 This entry was posted in Food Reviews, Thai and tagged curry, lunch specials, pad thai, Thai iced tea. My co workers and I were up for some Thai food and we noticed on U Magazine that U & I Thai had a coupon for 20% off lunch and dinner items. However, when we got there, they told us that it was only for their regular menu items and it did not apply to the lunch specials. All the lunch specials are $10. All the lunch specials come with soup. 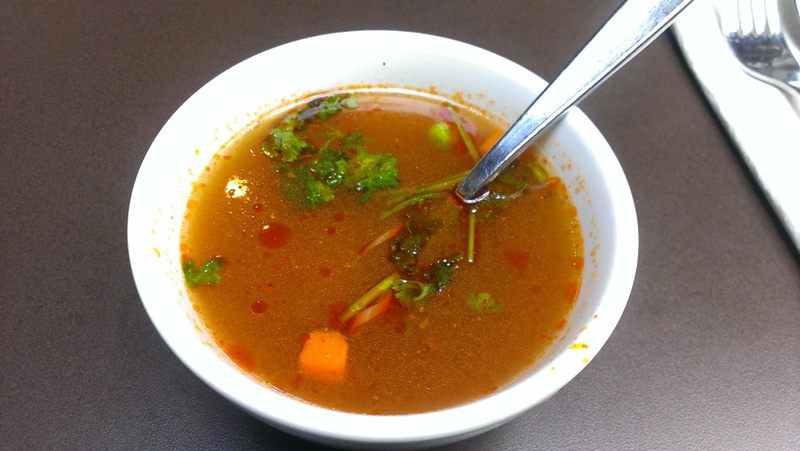 I’m not sure what soup it was but it tasted a bit tangy like tomatoes and fish sauce and it wasn’t really spicy. I was not a fan of this. This was the Green Curry and you have a choice of chicken, beef or pork. It was also served with the deep fried wontons and a side salad. The salad had no dressing though so it was left untouched. Maybe you’re suppose to put the curry over it? 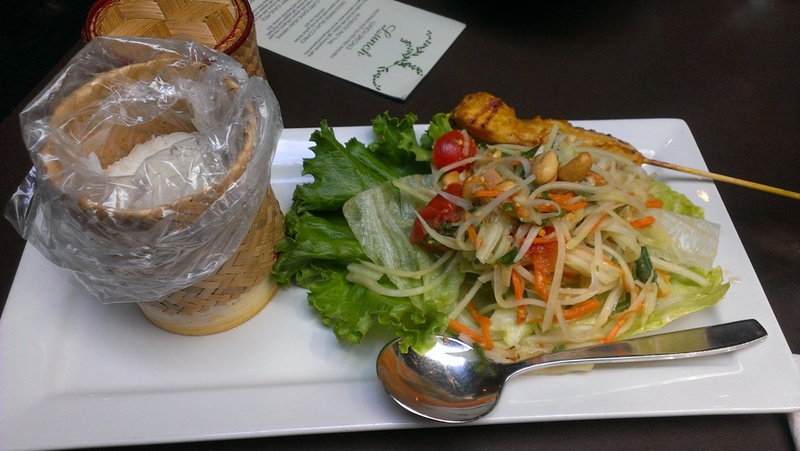 This was the Green Papaya Salad which came with a side of sticky rice and a grilled curry chicken skewer. The chicken was also dry and tasted mildly of curry. The sticky rice was a small lump but the container was cute. It was sticky alright! Otherwise it didn’t have much flavour to it. The shredded green papaya was in a tangy vinaigrette that was very appetizing though! There was only one waitress on the floor and I think the owner of the restaurant? The waitress was getting a bit overwhelmed though even though it wasn’t that busy. Ok besides the slightly slow service, I think I would have to come back for dinner to try their other menu items before I can rate their food. The food was ok but nothing to be excited about for lunch. Their coupon hasn’t expired yet though so go use it! 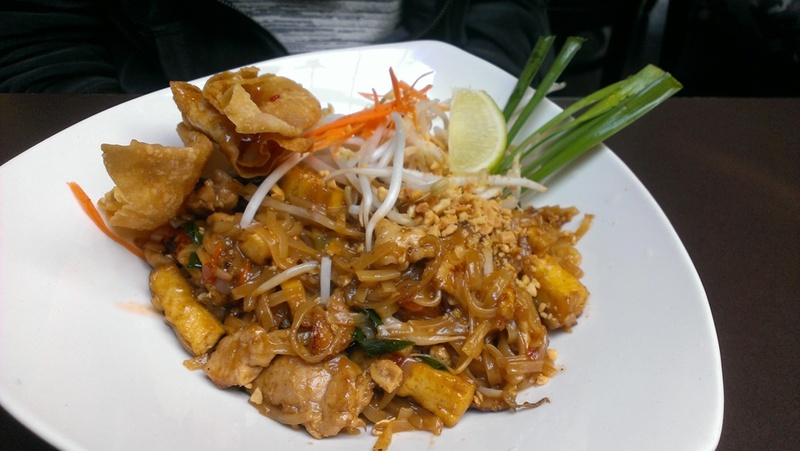 This entry was posted in Food Reviews, Thai and tagged lunch specials, pad thai.